Halloween is just a few days away and we are almost ready. It's one of those days that most children look forward to and most it is not because of the brand new costume of their favorite character that they're going to wear, it's mostly all about the candy that they get to consume that day and the days following! For most, this is the one time that they get to indulge in all the sweets they can eat. However, don't let this one day turn your kids beautiful smiles into trips to the dentist office. 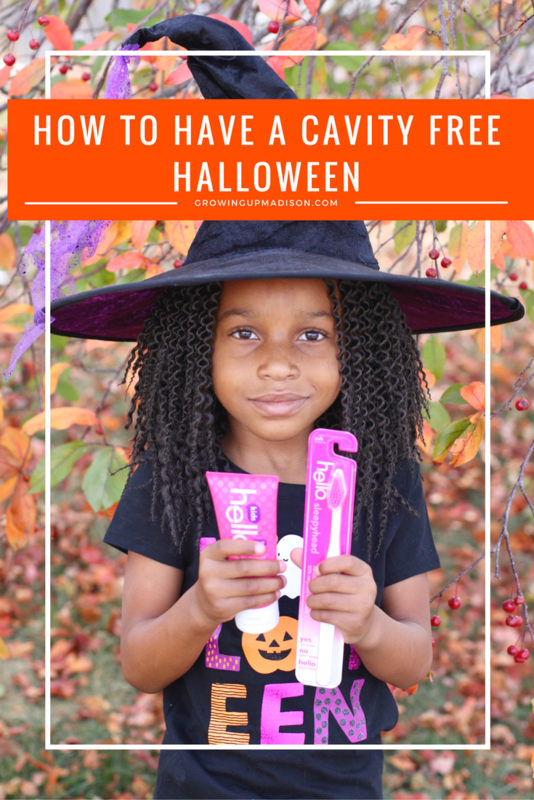 As a hello products ambassador I want to share with you, some tips on how you can have a cavity free Halloween, this Halloween and all year-round. While you don't want to the mean mom or dad, set a limit as to how many candy they can have while out trick or treating. Too much candy may not only give an already active child a sugar rush, but you'll also be out without any means to brush. Choose candy that can be eaten quickly to avoid your little one's white pearlies being exposed to prolong sugar. Candy that stays in your mouth for a long time, or stick to your teeth takes a longer time to be washed away, subjecting your teeth to an increased risk for tooth decay. Sticky candy can also stick to the grooves of your teeth and can be difficult to wash away as well. When you're on the go, you're not thinking of brushing so avoid the hard and sticky candy while out trick or treating. While you should brush at least twice a day, you should most certainly brush as soon as you get back from trick or treating. We know that they can't resist eating a candy or two while out, so brush and teach your little one how to floss, to get those little particles that their brush may not be able to get. It's very important that you brush before bedtime because sugar can linger on your teeth causing decay, and you don't want that! Remember to replace your toothbrushes at least every 3 months as well. If you are due for a cleaning, this is the best time to schedule that appointment. You should see your dentist at least twice a year so that your dentist can catch any problems before they happen. You may even be able to turn in some of those candy for a special treat! If you are going to be the one at home passing out candy, pass out "smile friendly" treats such as sugar free candy or even sugar free gum. We are even passing out little hello bubble gum mini toothpaste this year as a way to say "take care of your teeth". Also limit how much candy your little ones can eat at one sitting. As with everything, moderation is key. Let this year be a cavity free year for your little ones and don't forget to get your hello products at your local Target or Walmart. We're the same! We never let our guys our guys go totally nuts on their candy and we always make sure they take great care of their teeth. This is great! I'm also letting my kids enjoy the candy on Halloween, but then we are sending the rest to the troops over seas. That is a great idea and one that the troops will love! My kids had to divide up their candy and eat it slowly over time. My daughter never ate all of hers. I usually found some leftover candy at Easter and threw it out! We don't eat it all here at our house either. We usually throw it out after about a week. This is just a super idea for Halloween. One year we did give out toothbrushes. I always buy my kids new brushes for the day after Halloween. That is a great way to remember to replace your toothbrush. These are great tips for how to have a cavity free Halloween. I love the idea of passing out the little Hello toothpastes and the sugar free candy. I was thinking about handing out little party favor toys this year because a lot of kids can't have candy or they have allergies. Thanks for sharing the tips. That is a great idea as well. Maybe next year we'll just hand out party favors as well. 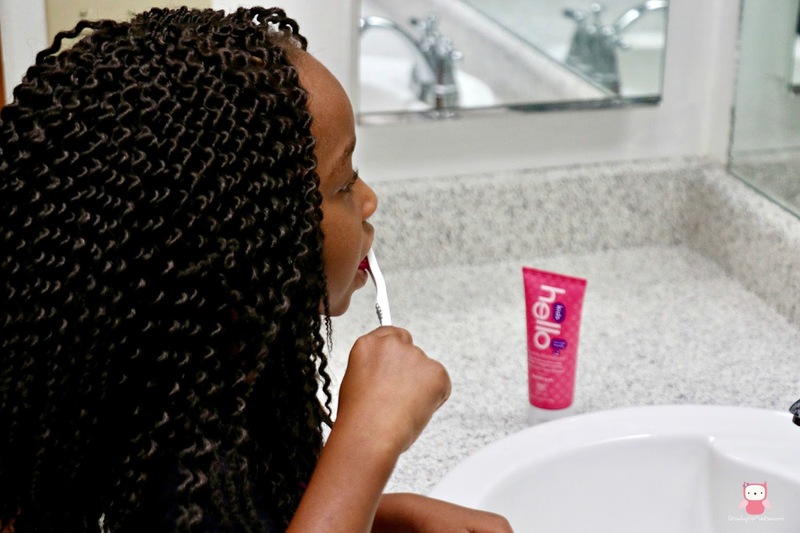 My daughter loves the pink Hello toothpaste. It is truly her favorite flavor! I hope we have a cavity free Halloween here too. That's the one my daughter loves as well. It's also her favorite. Will have to take a look at this when our little girl is older! Such an important thing to think of this time of year especially. Why when she's older? It's never too young to start thinking about dental hygiene. Limits and rules are important when it comes to candy otherwise, that's the only thing they'll eat until they finish all of the candies they have. I think these are awesome tips for parents everywhere! I'd love to try those Hello products as well. The hello products are amazing! They're currently the only thing we use! My kids started trick n treat yesterday! Of course, they ate all the candies in one day! WOW! One day? If I didn't get rid of the candy at our house, we'd still have candy left over the for the next year. What a great idea. I worry about all of the candy the kids eat on Halloween, I'll have to stock up on this. You'll love the hello products, give them a try. I have been fortunate enough to never have a cavity. My dental hygiene is something that is very important to me. That is awesome! I had my first cavity as an adult, not good at all. My kids are 3 and 5 so they don't even go out long enough to get loads of candy. Also, they get to exchange half of their candy for a new toy! That is definitely one way to get rid of the candy that you don't need. That's an idea I may have to do next year. nice idea...kids do love sweets and its quite difficult to control them....so these tips are really appreciated. And thank you for stopping by with your input. Cavities are the aftermath of Halloween so I appreciate the tips. You can however stop them before they happen. I still don't allow my kiddo to eat hard candy or taffy. It just gets stuck! I am loving that hot pink toothbrush! It's a good idea to not have him eat it and that hot pink toothpaste is by hello for kids. We try really hard around this time of year to make sure our kids are brushing really well. Too much candy is never a good thing and you can't seem to help it around Halloween! You got that right! Too much candy is never a good thing but you can counteract that by purchasing a new toothbrush and toothpaste from hello. These are good ideas! I love the idea of giving out the mini toothpaste instead of candy. Perfect way to counteract all that sugar. Yes it is, but we also gave out candy, the toothpaste was just a way to say "don't forget to brush after eating all that candy".